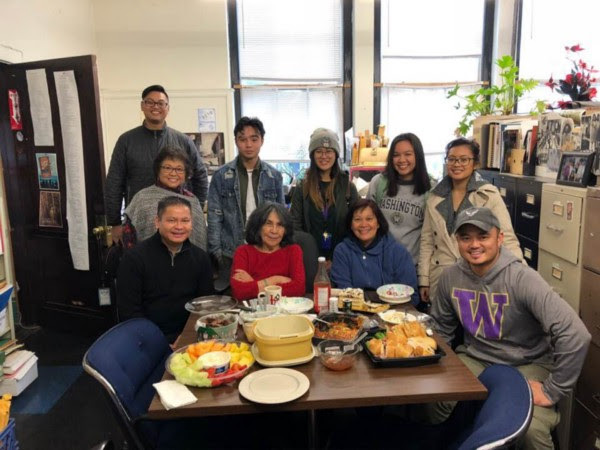 Every Friday afternoon, a group of volunteers at the FANHS (Filipino American National Historical Society) Seattle office gather around a small table for some kainan (sharing a meal) along with some kuwentuhan (sharing stories). The delicacies that the volunteers prepare are as flavorsome and colorful as the stories they share. The table is full of adobo, rice, lumpia, and salad while the air gets filled with all kinds of kuwentos (stories) about the volunteers’ hometowns, kids, grandkids, recent travels, and pilgrimages. The food and the stories shared form an invisible bridge that connects and strengthens the bonds they have with one another. Stories connect us. Stories move us. Stories shape us. Stories transform us. Whether we are on the giving or the receiving end of the story, we are bound to feel the story. Science tells us that storytelling changes our brain chemistry and behavior. As the neurons get fired up by the stories we tell or hear, our beliefs and behaviors open up to change. As the cortisol and oxytocin levels in our brain rise, our empathy and our social connections get strengthened. The neural activities in our brains begin to synchronize to march to the same beat, the beat of the story. Storytelling is an act of generosity. Storytellers generously share their knowledge and wisdom while listeners generously share their time, presence, and openness of mind and heart. Storytelling facilitates the flow of mutual compassion. In a time of divisiveness and discord, storytelling is just what we need to reconnect us. Storytelling builds bridges. Storytelling heals. The word commonly used to translate storytelling into Tagalog is “kuwentuhan.” However, there is something more to this word and its culture-specific connotations that a simple translation just doesn’t cut it. The ways in which we, Filipinos, share our stories are very much entrenched in our being, our cultural identity. In the Filipino culture, one which social scientists have often described as collectivistic as opposed to individualistic, there is a strong emphasis on social relationships and interdependence rather than on the self and independence. “Ka,” a prefix used for many Tagalog words, is often used to describe one’s relationship with others. For example, “kapwa” (shared togetherness), “kasama” (companion), “kaibigan” (friend), and “kapatid” (brother/sister). The symbol for “Ka” in pre-colonial Philippine language is depicted by two parallel curvy lines connected by a single line. It is symbolic of the emphasis on our connectedness. The regular FANHS volunteers who come every Friday to help Aunty Dorothy. The Filipino’s sense is more on the sociocentric end of the spectrum rather than the egocentric. Filipinos place a higher value on interpersonal cooperation (“bayanihan”), reciprocity (“kasamahan”), and social acceptance (“pakikisama”) rather than on the individualistic culture’s constructs of autonomy and uniqueness. Filipinos have strong family ties, and it’s not only with immediate family members but extended family members as well. Obedience and respect of parents and elders are highly valued and we owe our elders a deep sense of gratitude (utang na loob) for having paved the way for our stories and journeys. The ways we share our stories are shaped by our concept of the self, our social relationships, and our values. In our kuwentuhan, there is a shared togetherness. We share our stories with our “kapwa.” In a simple translation, “kapwa” means “other person” but according to Virgilio Enriquez, regarded by many as the Father of Philippine Psychology, “kapwa” really is better understood as “shared togetherness.” When we do our kuwentuhan with our kapwa, our stories are shaped and transmitted by our shared identity, our shared togetherness. A lot of the titos (uncles) and titas (aunties) I know like to ask the “Where are you from?” question when meeting someone for the first time. At first, it may sound pre-judgmental, especially in the American social context, but if we take the time to further reflect on that question, what we’ll find is that it really is an innocent and genuine way for Filipinos to establish the connection. It really is shorthand for asking, “Where did your journey begin, where has it taken you, where are your ancestors from, and how is your story similar to mine?” As kapwa tao, our journeys are connected and in many ways the same. As Professor EJ David said, “In kapwa, we are all the same — no walls, no levels, no separations, no better, no worse.” The question “Where are you from” is an invitation to share your story and realize our connectedness, our kapwa tao. The Filipino culture is a storytelling culture. Kuwentuhan is our way of preserving our stories, histories, heritage, and the values we hold. Stories connect us to our ancestors — the journeys they have taken and how they have paved the way for us. Storytelling is how knowledge, wisdom, and values are passed down from one generation to the next. Stories connect us to one another, with our kapwa. It is a way of building solidarity and cultivating our sense of shared identity. When we tell our stories and when we listen to one another’s stories, we discover and strengthen our connections. We put ourselves into the storyteller’s shoes. We insert ourselves into their narrative and we discover that we have more commonalities than differences. We find ourselves sharing in their stories of struggle and triumph. When we share stories, the activities of our “mirror neurons,” the building blocks in our brains for language and empathy, are highly active, producing genuine emotions as well as genuine social connections. When Western-trained social scientists and anthropologists first attempted to study the indigenous Filipino culture, they had to learn to use kuwentuhan as a methodology for collecting data because Filipinos did not just provide “data” to non-“kapwa tao.” They shared “data” only by kuwentuhan. If you really want to get to know the Filipino culture, you dine with them and you listen to their stories. You first become a kapwa to them. In current Philippine psychology and psychotherapy, kuwentuhan is an invaluable method used to build rapport and understand the context of the person. Today, in our rapidly changing society, the art of kuwentuhan is getting transformed, for better or for worse. With many of the stories moving to a digital platform, the essence of kuwentuhan is getting lost. It is true, the opportunities to connect with more people, especially in the digital world, are abundant. But as the quantity of our connections increase, the quality of our connectedness with our kapwa tends to suffer. It may be true that we are able to tell more stories, whether through social media or whatever digital technology, but are we really able to share them in ways that enable us to realize our connectedness? One of the roots of our problems in society today, especially with the many issues that divide us, is that we no longer share stories like we used. We think we do when we share snippets of stories or tweets, but are they really enabling us to share and hear where the other is coming from. The character limitations on our smartphones as well as our busy schedules restrict us from fully realizing how connected we truly are. They just do not give our neurons the opportunity to align, synchronize, and march to the same beat. We must tell our stories and we encourage everyone to tell their stories. But we must not forget how important it is to keep the emphasis on listening. As author Susan Cain put it, “in a world that cannot stop talking,” less and less people are on the listening side. The word “storytelling” implies an action word that goes one way — the telling of a story. Kuwentuhan is a lot more than just telling a story. The word “kuwentuhan” implies and requires both acts of telling and listening where a story is shared between and/or among kapwas. Today, it is more important than ever that we continue our kuwentuhan. We need to discover and rediscover our connections and commonalities, with our kapwa, with one another, and with our ancestors, those who have paved the way for us. We need to realize how linked our journeys are, how similar our struggles are, and how much of a shared identity we have as a people. We need to cultivate our connectedness. We need to continue to preserve our histories, where we came from, how we came to be, how we got here, and realize that we are kapwa tao, with a shared humanity and a shared togetherness. Kuwentuhan tayo. The mission of the Kuwentuhan Tayo Project is to facilitate the sharing of our kuwentos (stories) in order to preserve our narratives and histories, to share our journeys, to know where we have been and where we are going, and to cultivate our sense of connectedness with our kapwa. To learn more, visit www.KuwentuhanProject.org. BJ Gonzalvo, PhD, is an organizational psychologist, an immigrant from Laguna, Philippines, a military veteran, and author of Lessons in Leadership from the Saints. He is currently collecting kuwentos, narratives, reflections on what faith means to Filipinos in America today. He lives with his wife and two children in Seattle, WA. Khimee Leong, is a Filipina American who immigrated to the U.S. when she was five years old. She was raised with her two brothers in Maryland but has always strived to stay true to her Filipino heritage. Thanks to her parent's guidance, she has a passion for service and dedicated her career to helping others through various non-profit work. Currently, she is in a master’s program focusing on a social entrepreneurship curriculum working to shed more light on mental health awareness among the Filipino American community.